Good morning from a rainy Mishawaka, IN. Love the pictures but that's as close as I really want to be. I would never make it up the steps, my fear of heights would over take me before I was anywhere near the top. The view from the top must be beautiful. I'd send my camera up with someone else. Day off of school today for Martin Luther King Day. Gives me time to get ready for my trip to Toronto on Friday. Man oh man. I get a nose bleed on the third rung of a ladder. Those skiers are VERY brave! Don't those people know that trees move in the winter. They're attracted to skiers. The view from the top is definitely worth the climb! My husband and I climbed to the top many summers ago. You feel like you are at the top of the world. Every year the Suicide Hill Ski-Jumping Competition in the Upper Peninsula of Michigan welcomes skiers from the United States, Finland, Germany, Japan, Austria, France, Norway, Canada and other countries. 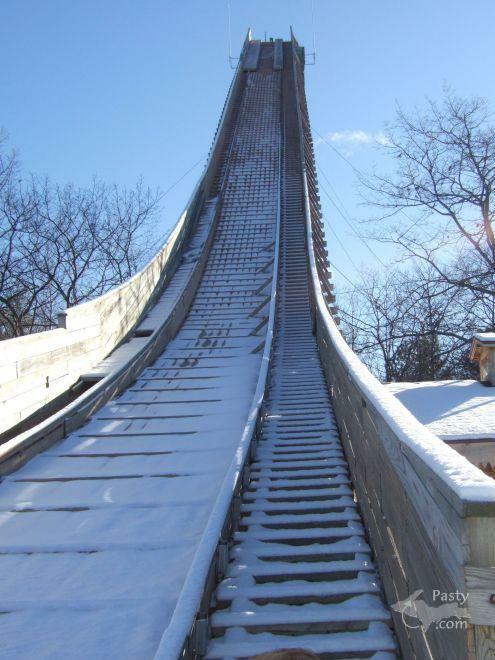 The jumpers come to the United States as part of the ski-jumping circuit, earning points at each jump which apply towards their standing in the race for the individual cup. 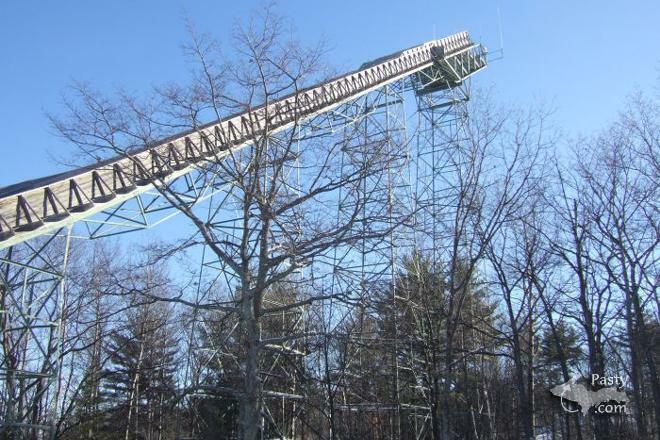 They make two stops in the Upper Peninsula: the Pine Mountain Ski Jump in Iron Mountain and the Suicide Hill Ski Jump in Ishpeming. 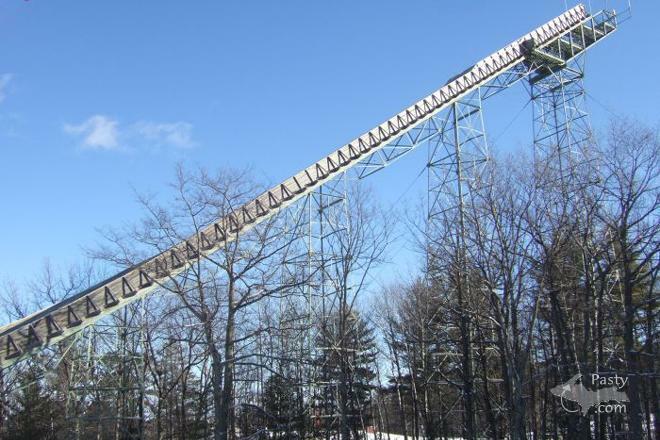 I know Copper Peak ski jump is still in Ironwood because I fly over it a couple times a week. They have not used it for a few years except for snowmobile hill climbs. Last year, it was cancelled due to lack of snow. I don't ski jump but have flown my parachute down Pine Mountain jump and landed on bottom for a Veteran's event. I started from a plane.It would be scary with only boards on your feet. I just updated the Snow Thermometer page snow totals for Keweenaw County. We now have 70.4" for the season total and 15" on the ground. Just in time for Heikinp�iv�. Dr. Martin Luther King Jr. was a true hero in the greatest sense of the word. All of our children deserve to understand his time and his contribution. Unfortunately, schools in Michigan, and I'm sure elsewhere, have become test-driven, which makes them "state ordained" curriculum driven. Teachers today do not have the freedom to teach as teachers did in my entire career. and we discussed his contributions to the US as well as the world. Maija -- I couldn't agree more. All the joy has been taken out of teaching because of tests! That's why I retired May 23 -- the first moment I was eligible! 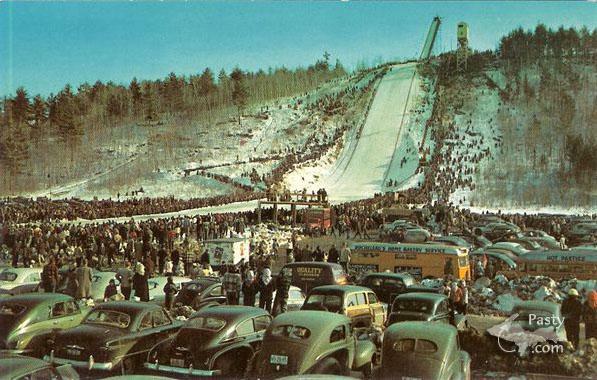 An addition to the conversation here from Betty Catalano, who sent me this postcard of the Pine Mountain Ski Jump, dated 1951. Betty says, " The back of the card says that they soar almost 300 ft -- I was there the first time that 300 and more was hit--- now I understand that they get close to 400--" Also, take note of the cars in the photo and the small building at the top of the jump! Thanks Betty!